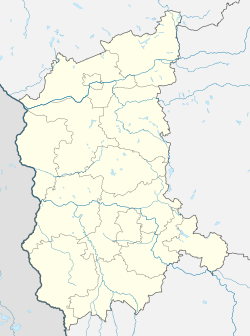 Słubice [swuˈbʲit͡sɛ] (German Dammvorstadt) is a border town in the Lubusz Voivodeship of western Poland. Located on the Oder river, directly opposite the city of Frankfurt (Oder) in Germany, of which it was a part until 1945 (as Dammvorstadt). At the 2011 census, the town had a total population of 18,000 (urban agglomeration Słubice-Frankfurt 85,000). Previously located in the Gorzów Wielkopolski Voivodeship (1975–1998), the town is currently the capital of Słubice County and the administrative seat of the Gmina Słubice. The name is a modern Polish restored version of Zliwitz, a West Slavic settlement east of the Brandendamm causeway across the Oder, mentioned in Frankfurt's city charter of 1253. The Ascanian margraves of Brandenburg had purchased the surrounding Lubusz Land from the Silesian Duke Bolesław II the Bald in 1248. 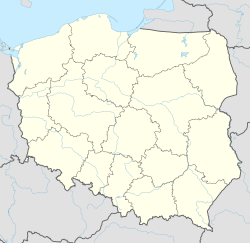 Słubice is closely linked to its German sister city Frankfurt (Oder), of which it was a part until 1945. The two cities have been forced apart by the drawing of the Oder-Neisse line, by which Germans have been expropriated and expelled from the lands east of the Neisse. The two cities share many urban amenities and collaborate on various projects, such as a wastewater treatment plant in Słubice that serves both towns, as well as the Collegium Polonicum [pl] extension of some of the Viadrina European University's departments on the Polish side of the border. Furthermore, Słubice is part of a special Słubice-Kostrzyn Economic Zone. Słubice was the setting for the 2003 film Distant Lights (Lichter) as well as for scenes in the 2002 film Grill Point. On October 22, 2014, a monument to Wikipedia editors was unveiled in the town, the first such honoring of the worldwide Wikipedian community. ^ "World's first Wikipedia monument unveiled in Poland". Thenews.pl. 23 October 2014. Retrieved 3 November 2014. Wikimedia Commons has media related to Słubice.